Terry Masters was born in Sacramento, California in 1955 and his family moved to Palm Springs for the benefit of his mother's health in 1967. His love for the desert was instant. He had enjoyed drawing all his life and was helped along with two very good instructors in Tom Hamilton and Joyce Vilman in Junior High and High School. He attended the College of the Desert from time to time and learned some things there from William Hemmerdinger. In 1979 Masters met Elliot Field, the manager of KPSI radio, and had the good fortune to work for Ric and Rozene Supple at their broadcast facilities for 21 years. In 1994 he made a New Year's resolution ("The only one I have ever kept," he says.) to start to paint, something he had intended to do since admiring the Paul Grimm paintings all over town in his youth. After some success in acrylic paint he was steered toward painting outdoors in oil. That was 1999. That changed everything. He went from painting one painting every two weeks to starting one to three paintings every day. "So here we are a couple of thousand paintings later," says Masters. Landscapes of the desert southwest are a primary focus for him, but "anything with dramatic light is fair game," he states. "As for my philosophy on painting... I just look for things that catch my eye and then do my best to render them in an honest, painterly way. I tell my friends I am 'the painter of whatever'. Everything is fair game and that is the way I like it." "My philosophy on my own work is pretty simple," says Masters. "I work always to raise my ability to portray beautiful light and color on subjects in the most convincing way that I can. I really don't paint based on mood or emotion. The main message in my work is 'isn't this a beautiful planet'." Masters credits his workshops and fellow painters for his current level of accomplishment in oil painting. Ken Auster, the great Laguna painter gave him his first instruction in painting "en plein aire". Other painters he credits with helping him along the way include Robin Hall, Jason Situ, Michael Situ, Scott Prior, Debra Huse, Russell Case, Daniel Gerhartz, Jeremy Lipking, Glen Dean, Mark Kerckhoff, Matt Smith, John Budicin, Elaine Mathews, Mehdi Fallahian, Gregory Hull, Carole Cooke, and Albert Handell. 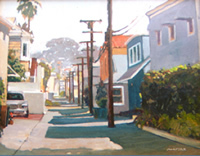 Painters of influence include Paul Grimm, M.C. Escher, Maxfield Parrish, John Singer Sargeant, Jauquin Sorolla, Edgar Payne and the early California painters, Maynard Dixon, Nicholi Fechin and the Taos groups, Clyde Aspevig, Daniel Gerhartz and Mark Kerckhoff. In 2002 Masters won the 1st place award at the City of Palm Springs Art Competition. In 2003, he placed first in the City of Palm Springs juried exhibition. He has participated in the La Quinta Arts Festival, the Desert Plein-Art Competition, and the City of Palm Springs Art Competition. In 1996, he received the Larry Sitter Memorial Award for best desert painting at the Riverside County Fair and National Date Festival. He has exhibited at the Phippen Museum in Prescott, AZ. 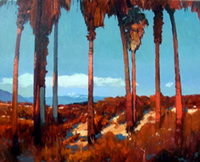 Masters is an artist member of the California Art Club as well as a member of the Laguna Plein Air Painters Association.